Blackhaven is the fictional backdrop for plays and sketches created by Theo Seller (aka Seymore Strangley). The website allows you to listen to podcasts featuring the characters of the village. If you're a fan of comedy horror then you can head over to the website to stream the stories. 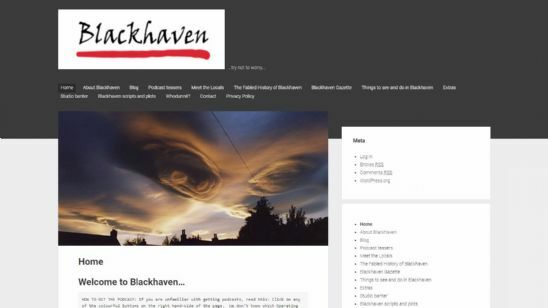 The website also gives you plenty to browse, including an opportunity to meet the people from the stories, read the history of the village, and read the Blackhaven gazette which includes the latest news. There's also information about the real people behind the voices along with scripts and plotlines. Theo himself is based in Cromarty, not too far from the Calico offices. That means it was very easy for him to have a chat with us about his domain and hosting requirements, and for him to contact us for helpdesk support if required. He's certainly keeping it local! If you'd like a .scot domain for your website project, register your DotScot with Calico.